CHITTENDEN—The holidays are a time for traditions, and at Barstow Memorial School, this holds fast. 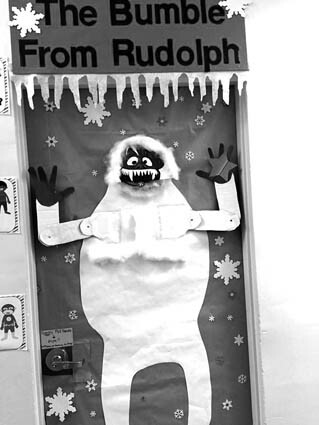 With one tradition added just last year, a thematic door decorating contest, students and staff are able to creatively express themselves, work within their classes to construct their works of art. This year’s door masterpieces included 3D snowmen, the Polar Express, Jack Frost, Rudolph in the dark, Christmas trees, menorahs, snowball fights and even a skiing skeleton! With the playground equipment being deemed unsafe, the Barstow community is trying to raise funds for its replacement in the spring. An idea was developed by teachers to sell tickets to engage students and parents in voting on their favorite door. This effort resulted in the raising of $294. Renee Castillo, principal, added, “Not only was it fun and festive, but it gave students a sense of ownership in helping raise the money needed for a new play structure.” This year’s winning door was the Teacher Advisory of Mrs. Valcour and Ms. Marckoon, which had 214 tickets. The school caps off 2016 with the entire school coming together to sing renditions of such favorite classics like “Let It Snow,” “Winter Wonderland,” “Frosty the Snowman,” and “Jingle Bells.” Led by music teacher, Hannah Yarwood, students from different grades are brought together to lead the school in these fun songs, which help build up excitement for the holidays among students and send them off on a high note. Students decoraded school doors at Barstow.